The Vietnam War was one of the most heavily documented conflicts of the twentieth century. Although the events themselves recede further into history every year, the political and cultural changes the war brought about continue to resonate, even as a new generation of Americans grapples with its own divisive conflict. America and the Vietnam War: Re-examining the Culture and History of a Generation reconsiders the social and cultural aspects of the conflict that helped to fundamentally change the nation. 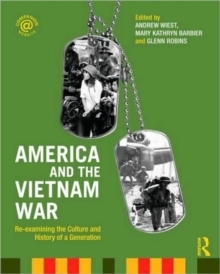 With chapters written by subject area specialists, America and the Vietnam War takes on subjects such as women's role in the war, the music and the films of the time, the Vietnamese perspective, race and the war, and veterans and post-traumatic stress disorder. Features include:chapter summariestimelinesdiscussion questionsguides to further readinga companion website with primary source documents and tools (such as music and movie playlists) for both instructors and students. Heavily illustrated and welcoming to students and scholars of this infamous and pivotal time, America and the Vietnam War is a perfect companion to any course on the Vietnam War Era.